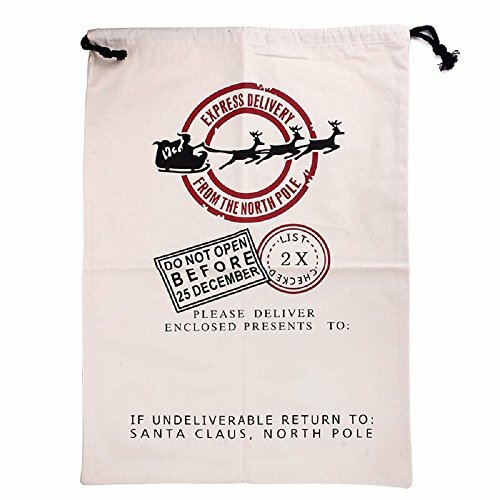 The sack is printed with the words"NORTH POLE POST OFFICE ,OVERNIGHT DELIVERY " and DO NOT OPEN BE FORE 25 DECEMBER,PLEASE DELIVER ENCLOSED PRESENTS TO:"
Material :100% New Cotton, Green material,Safe to contact with skin or food,Machine washable and hand Wash, thick and durable bag. If you have any questions about this product by IGBBLOVE, contact us by completing and submitting the form below. If you are looking for a specif part number, please include it with your message.